In December I shared my traditional red & green Christmas quilts that I had hanging in my studio. If you missed the post, you can catch it here. 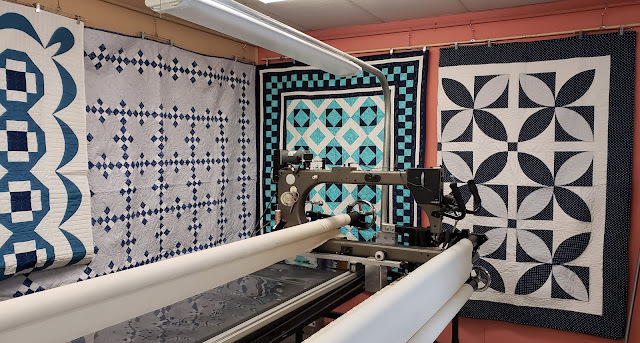 I've taken those quilts down and with the help of hubby, have a few of my blue and white Winter quilts hanging. I know I shouldn't admit this, but there were a few of these quilts that I had forgotten about making. It's good to get them off the shelves and out where they can be seen. So here are the photos - I'm working from Left to Right as I describe each one. 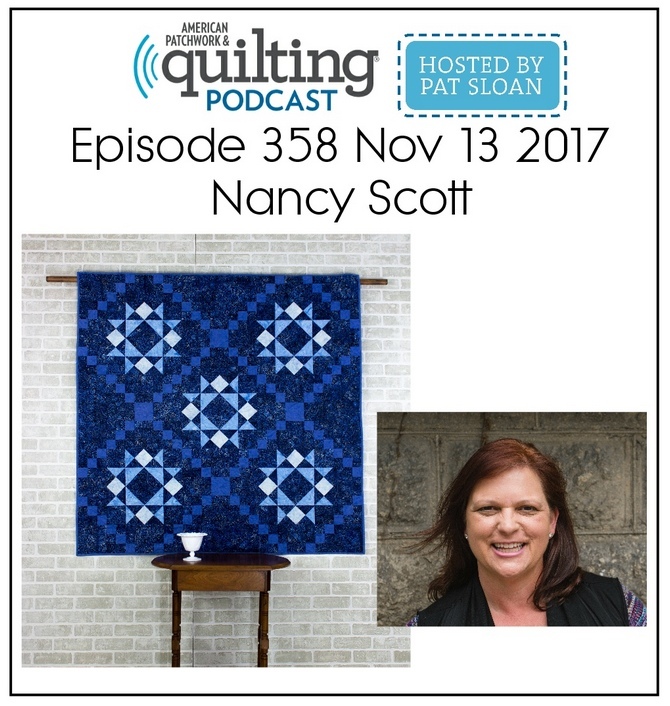 And I'm skipping the video this month, so I will share more about the quilting as I describe each quilt. On the left is Fractured - which is one of my Masterpiece Quilting brand patterns. To learn the back story on Fractured, check out the blog post I wrote about it last year. The pattern is available for purchase as a PDF download on Bluprint. The white background fabric has a bit of silver metallic for a winter-y touch and it is quilted with a snowflake edge-to-edge pattern. Fractured is the same base pattern I used to make the Oh Deer quilt for Island Batik's new Oh Deer Collection which was shown at Quilt Market last Fall & is shipping to stores now. That modified pattern is available in my Etsy store. 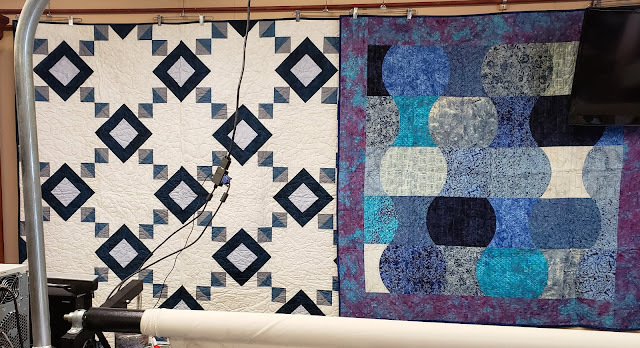 On the right is Baubles which was just in the Winter 2018 issue of Quilter's World Magazine. It is also made with Island Batik fabrics and Warm 80/20 batting from The Warm Company. Baubles might seem like an unusual name for a quilt, but when you read the back story, it will make perfect sense. From Left to Right: On the Left is the Grecian Squares & Swags Bed Quilt. This quilt was just my 3rd quilt design to appear in a publication! It was published in 2013 in Annie's Applique Techniques Made Easy Book - which is no longer in print :( The blocks create a secondary pattern in the center of the quilt and were quilted with individual block patterns and the appliqued swag border was custom quilted with straight line quilting. In the middle is Nine-Patch Beauty which was in the Winter 2015 issue of Quilter's World Magazine. This traditional patchwork quilt uses gray as the background and is paired with blue and white nine-patches. It was quilted with an all-over pattern for texture. On the right is Checkerboard Beauty which was Annie's Quilts with Unique Borders Book which was published back in 2014. I really feel old when I think about how long ago that was and how much my design style has evolved over the years. Sadly, Quilts with Unique Borders is no longer in print either. Again this quilt was quilted with individual block patterns and custom quilted in the borders. On the very left you can see a bit of the custom quilting in the border of Grecian Squares & Swags. Next is Nine-Patch Beauty and Checkerboard Beauty and then finally on the right is Orange Peel. Orange Peel is one of three quilts that I teach how to make in my Learn to Restyle Vintage Quilts video class and was inspired by an antique quilt of my Grandma Scott's. You can read more on the back story in a previous blog post. This quilt was full-custom quilted with lots of feathers - my favorite! Well that concludes our tour! I hope you have enjoyed seeing some of my quilts. Stay tuned for a Spring Quilt tour coming sometime in March. 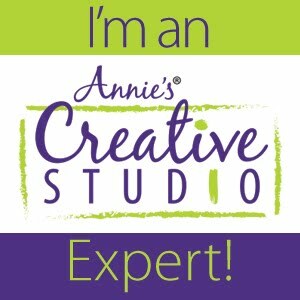 I've got lots of Spring quilts I can't wait to share with you! Thanks for the tour. It is fun to see how our design choice and style changes over time.